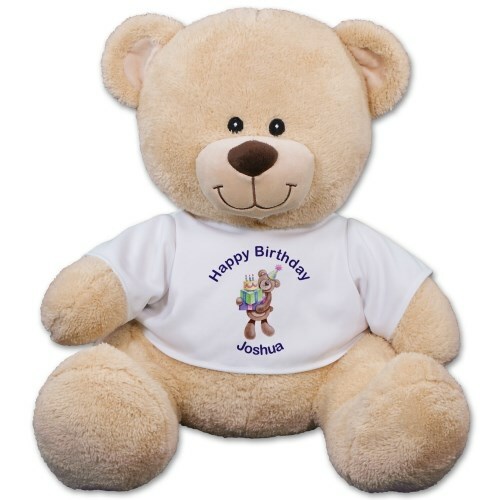 Create amazing birthday memories with this enjoyable, Plush Birthday Teddy Bear. No matter the age, this pleasing teddy bear is sure to be a hit at the party. This artistic design is featured on our Sherman Teddy Bear. It is truly special because it includes free personalization of any two line custom message. So, you design it for your special someone! Sherman is available in three different sizes. Please choose from our 11 inch, 17 inch or our 21 inch teddy bear. Free gift wrapping and a free gift message are included to create a thoughtful presentation. Additional Details Create a wonderful birthday gift that will last a life time with Plush Birthday Gifts from 800Bear.com. Our plush animals are loved by all and become truly unique and fun keepsakes for everyone!